The ACMG Training and Assessment Program just finished the first of two Apprentice Ski Guide Touring Courses. We skied from Jan 22-26 in the Whistler and Blackcomb backcountry areas as well as two days on Cayoosh mountain in the Duffey Lake area. We started the week skiing supported below treeline and lower tree line features due to stormy weather. As we gained confidence towards the end of the week, we skied steep unsupported terrain in alpine and tree line on all aspects from 1260- 2400m. The week started with 30 cm of storm snow that fell on a variety of surfaces - wind scoured in the alpine and upper treeline, sun crust on solar aspects and well-preserved surface hoar below 1900m in sheltered areas. We observed snowpack depths of around 300cm+ on glaciers, and 250cm at tree line. Mild temperatures promoted rounding and settlement in the snowpack. On Jan 26, there was a strong inversion with temperatures well above freezing to mountain top. This caused moist snow all asp to 2000m, and moist on solar aspects to mountain tops. Jan 17 storm snow interface down 30-60cm (surface hoar, facets, sun crust depending on aspect and elevation) was unreactive to skier traffic, with variable moderate to hard, resistant test results. Our most significant concerns were loose wet avalanches on steep solar aspects and large cornices in the warm temperatures. Overall, ski quality was mostly good during the week with the best snow in sheltered north facing locations. Wind exposed alpine features were affected and lowered overall ski quality. 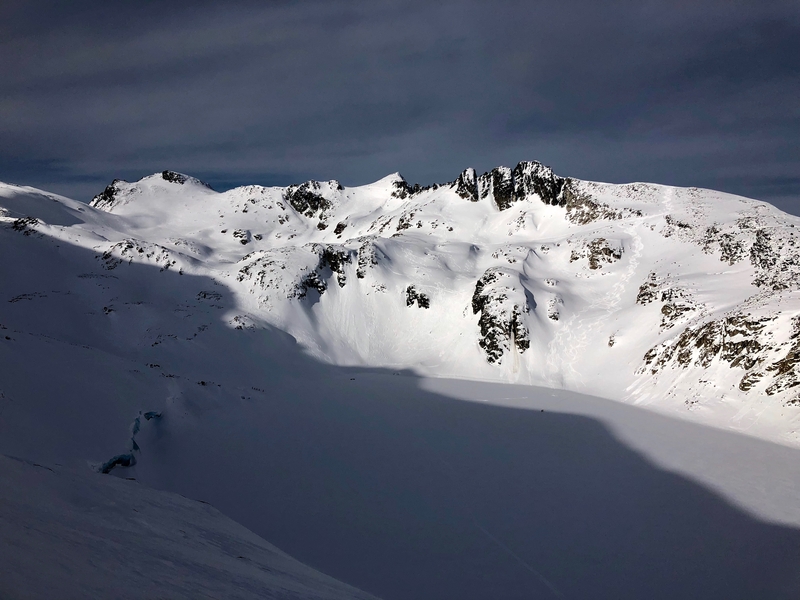 Lots of ski tracks in the Blackcomb backcountry showed overall good stability and a high number of travellers.